With the highest power prices in the world by a comfortable margin, routine load shedding and mass blackouts, caused by routine and sudden wind power output collapses, South Australia is the place where no sensible international investor will ever bother to hang their hat again, and a place from which a growing number of its remaining local business owners would flee in a heartbeat, if they could. So why, oh why would Australia’s most economically successful and populous state, New South Wales, have any desire to follow the path set by Croweaters? Dr Michael Crawford takes on STT’s rhetorical in this thumping letter to New South Wales Liberal Energy Minister, Don Harwin. The hulking Harwin is quite apparently a man of some considerable appetites. However, it’s his appetite for economic and social destruction that’s fired up Dr Crawford, and rightly so. We as NSW citizens are to have the security and affordability of our electricity restored by a Keystone Cops cast of bureaucratic agencies whose “planning” and “management” have given NSW consumers the least secure and most expensive, in real terms, electricity in sixty years. We don’t need to worry about electricity security in the near term because you and your department are relying on the Magic Pudding Electricity Supply theory and, if that doesn’t work then as a back-stop there is the Chief Scientist’s “turn off the lights” policy to save the grid. We should be grateful that under your outstanding leadership we have electricity plans coming out our ears – but not cheap, reliable electricity coming into our homes and businesses. And just to round out the mix, your letter contains a number of untruths, or what we citizens outside politics recognise as outright lies. If I seem a little crotchety in my comments it is because I have lived more than 70 years, most of them in NSW. I have seen what reasonably competent officials concerned about the welfare of the State can deliver in terms of electricity security and prices – and I have seen what incompetent officials can do to destroy that. Let’s start with a little history. Perhaps your department has never bothered to show you a graph like that below. Is that because they are happy to keep you in the dark, or is it because they don’t have a clue themselves? The graph shows inflation-adjusted consumer electricity prices since 1955, i.e. over a period of more than 60 years. The graph is for Australia as a whole but if you check ABS stats you will find NSW electricity prices and their movement differ little from the national average. Since NSW is such a large part of the Australian economy that is not surprising. From 1955 until the early 1980s, real consumer electricity prices fell almost continuously, declining in real terms by 45% from those in 1955. Then we had the high inflation era of the mid-70s through the 1980s and the high interest rate environment of the 1980s, which had some cost consequences for capital-intensive businesses. Nonetheless, despite that difficult economic environment, real electricity prices kicked up a bit in the early 80s and then began to again decline until around the turn of the century. Throughout that period of efficient, reliable electricity production, provision to the people of NSW was wholly in the hands of the NSW Government, including your predecessors in your current role. They built and owned the power stations and transmission lines. They produced the electricity and were responsibility for its reticulation throughout the State. They clearly did a good job because we had reliable, cheap power and the State’s economy and its people benefitted. The National Electricity Market (NEM) was established at the end of 1998. Being a politician you will understand it was promoted to the public on the grounds that it was going to reduce electricity prices. You can see how that worked out – real prices have since doubled. At the time no one was promoting it on the grounds of improving electricity security since we already had high electricity security, which the public took for granted as a bedrock responsibility of our State Government – something at which you and your Government are now failing. 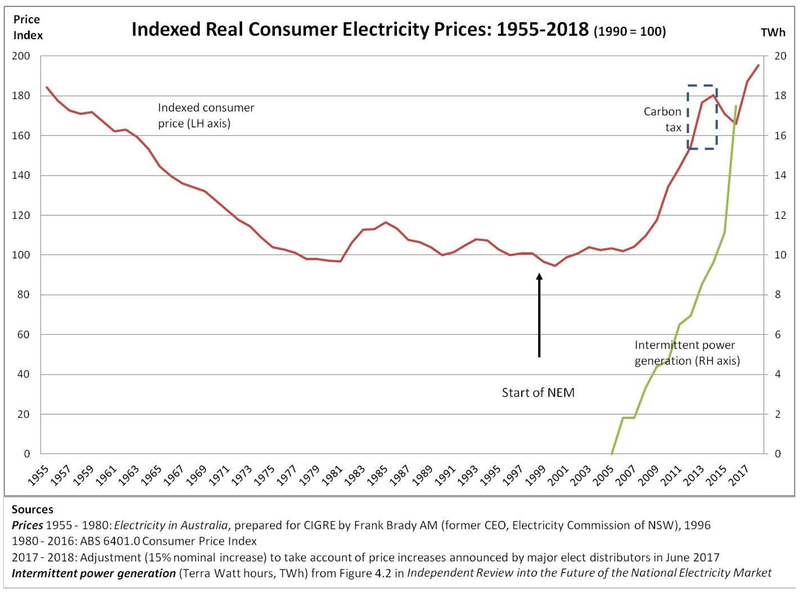 As the graph clearly shows, real electricity prices have doubled since the turn of the century, with almost all the increase occurring since 2005, and with that increase highly correlated with the increasing proportion of intermittent power generation (i.e. wind and solar), which has also brought us massive threats to our power supply since they don’t work when the sun is not shining and the wind not blowing (or blowing too strongly, as South Australia discovered). So what are you, as the NSW Minister for Energy actually doing to restore cheap and reliable power? Dr Finkel’s forecasts relied on assumptions about adding power generation backup or storage facilities in order to try to counteract the insecurity due to intermittent power generators, but neglected to include those in the costs of the system for which industry and consumers will have to pay. Did your advisors fail to make you aware of these inconvenient facts before getting you to nail your colours to Dr Finkel’s mast? The Finkel report is a recipe for even more disaster for the NSW electricity consumers, based on gross dishonesty which appears to place it in breach of section 137.1(1) of the Federal Criminal Code Act 1995. NSW Climate Change Fund Strategic Plan. Do you understand how absolutely insane and simply incompetent this sounds? These are precisely the agencies which presided over the 100% increase in real consumer power prices over the last decade, and have brought our electricity system to the brink of failure. Do you think the more unaccountable, well paid (by NSW taxpayers) officials you have running in circles, the cheaper and more secure will be our electricity supply? When NSW Governments almost halved the real consumer price of electricity from the mid 50s to the 80s, they did it without the phalanx of bureaucrats whom you apparently expect to substitute for you doing your job. The power stations and transmission lines did not fall from the sky. They were actually planned and built by NSW Government employees who thought it their job to provide cheap and secure power to the State, not to write endless papers and reports and hold meetings which preside over failure. Nowhere in your letter is there the slightest indication that you believe it is your personal responsibility as Minister to ensure we have cheap and reliable power or that you, as Minister, are going to directly take action to ensure, using the authority and resources of our State, we again have cheap and secure electricity. Under the Australian and NSW Constitutions, the power and authority to produce and control electricity for NSW rests with the NSW Government, and since you are the responsible Minister, that means with you. Your letter propounds the Magic Pudding Electricity Supply policy. According to your letter we are “well positioned for reliable supply”, particularly because “NSW can also draw on supply through connections with Victoria and Queensland”. Are you unaware that when it is high summer in NSW it also is high summer in Victoria and Queensland? Have your advisors not told you that Victoria and Queensland are looking to draw on supply from NSW when there is a shortage of power; or that South Australia is looking to draw on supply from Victoria and NSW when there is a shortage; or that the linchpin in this system of mutual dependence was the Hazelwood power station which was shut through a combination of wilful destructiveness on the part of the current Victorian Government and dithering by the Federal Government? 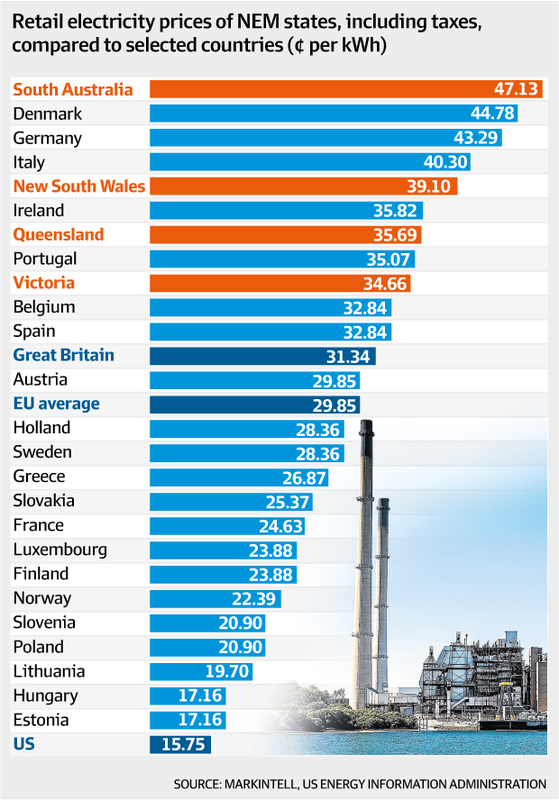 Under Energy Ministers such as you, the Australian states are like a bunch of penniless pickpockets each expecting to get fed by picking one another’s pocket. In the event that the Magic Pudding doesn’t work as you hope, you offer a backup plan, attributed to the Energy Security Taskforce led by the State’s Chief Scientist, which is “get some people to turn off their power”. Do you seriously imagine you are meeting your responsibilities as Energy Minister when instead of ensuring we have reliable power, your solution to grid insecurity is to have people turn off their power? That policy is in fact a blatant admission of failure by the gaggle of incompetent officials to whom you have ceded your responsibility to ensure the lights stay on. According to your letter “Private sector investment in new generation, like wind power, is important to ensure our system security”. This demonstrates that you are totally ignorant about your portfolio or simply pop out lies to cover your failure to serve the people of NSW. Perhaps your advisors never told you that wind turbines only generate power at the unpredictable times when the wind blows (and not too strongly), and even when it is blowing there is large variability in power output. You might want to let your fingers do the walking and consult http://anero.id/energy/wind-energy for detailed electricity output records from wind farms, showing their variability. Our electricity insecurity has been caused precisely because of the inclusion of highly subsidised intermittent electricity generators (wind and solar), which have also caused our high prices for electricity. For more detail I refer you to my open letter to Dr Finkel about his “Blueprint” which you laud. I have seen no reply and no refutation from Dr Finkel to my description of his dishonest and incompetent report. Your letter includes the dishonest claim that we are undergoing “an industry-led (my emphasis) transition to a lower emissions generation mix”. The rush to install intermittent electricity generators is not “industry-led”. It is government-driven via two mechanisms. The first is the Federal Government’s, Large-Scale Generation Certificates (LGC), mandated under the RET, which enforces a direct subsidy for all intermittent power, which electricity consumers in NSW and other states are forced to pay. Surely you know this. The second is the practice of the NSW Government’s planning agencies to approve intermittent power generation applications without any consideration of the impact that will have on NSW electricity security and NSW prices. Were the Federal Government not forcing all electricity consumers to subsidise intermittent electricity production, and were your government not approving connection to the NSW electricity grid of generators whose supply is both intermittent and unpredictable (wind and solar), the disaster over which you are presiding as NSW energy minister would not be happening. Then there is your ridiculous claim that this is all “Guided by NSW’s world-class experts”. Have a look at the graph above. The NSW Government engineers and officials who provided secure power with a 45% reduction in real consumer prices between 1955 and 1980 had some claim to being “world-class experts”. Whoever you are now employing in the NSW Government, while recent governments have doubled real consumer prices and brought us to the edge of state-wide blackouts is anything but an expert. 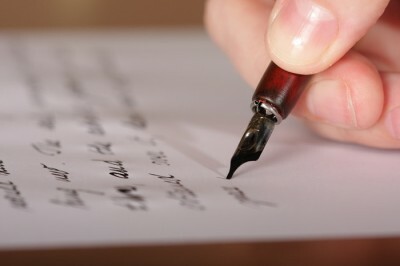 Nowhere in your letter do you offer any quantitative targets for reduction in real electricity prices nor any metrics for reliably producing as much power as the people of NSW and its industry want. Instead, the only quantified targets you provide are to make things worse. There you have the big lie, favoured by Dr Finkel, that intermittent energy producers are “clean” while our traditional sources are not. Again, I don’t know whether you are simply clueless or actually lying in order to favour the producers of intermittent energy. However, carbon dioxide and water vapour, the predominant emissions from modern coal-fired power stations, are not dirty and not pollution. For more detail on that, consult my letter to Dr Finkel, who has offered no refutation and no evidence to show that carbon dioxide and water vapour are in any way pollution or unclean. Your other target is to achieve a “16,000 gigawatt hour energy savings target” by having “NSW households and businesses reduce their energy use”. China, India and other countries are trying to rapidly expand energy use by their consumers and businesses, knowing that efficient energy production and use is the bedrock of economic development and affluence. You, however, proudly proclaim your target of having us use less energy. Energy ministers in China, India, all of the ASEAN countries and many others are looking out for the interests of their peoples. You, however, are doing just the opposite. Of course, doubling the real price of electricity, as NSW Governments have achieved in the past decade, leads to a reduction in electricity consumption. That is simple economics. So under your stewardship we are well on our way to your goal. The costs of that goal fall most heavily on the least affluent members of our state – which fortuitously does not include you or your advisors. ABS data (65300DO001_200910, Table 3) for NSW shows the proportion of household expenditure on domestic energy is lowest for those in the highest quintile of gross household income and highest for those in the lowest income quintile. In fact, in 2009-10, when the explosion in consumer power prices was just getting underway, households in the lowest income quintile already had to devote 76% more of their household spending to buying power than did those in the top quintile. For households whose income was in the second lowest quintile that proportion was 62% higher than for the top quintile. Given the rapid increase in electricity and gas prices, those lower income quintiles will now be either spending a higher proportion of their income on power – or going without power in order to help you get your targeted consumption reduction. The simple fact is that your policy is not just an attack on all NSW citizens, it is an attack most heavily on the poorest NSW citizens. You are indeed a “man of the people”. It also has broader economic consequences for the state. When consumers have to spend a greater proportion of their income on power, they necessarily have less to spend on medications, food, clothing, travel, entertainment, etc. That inevitably means fewer jobs in providing those other goods and services throughout NSW. So when you claim your “Renewable (i.e. intermittent, high priced, unreliable) Energy Target “will deliver thousands of jobs across the State” without mentioning the tens of thousands of jobs lost in other industries as a consequence*, you again demonstrate either ignorance or dishonesty. I am sure there are junior economists in Treasury who can explain to you the fallacy you are promoting. * Excess household expenditure (compared to holding real energy prices at 2000 rates) by NSW consumers is approx $3.9Bn in 2017 and $4.4Bn in 2018. Australian businesses, on average, employ one person for just under each $300,000 of income (extrapolated from ABS 81550DO001_201314). Consequently, $3.9Bn which consumers had to spend on energy due entirely to price increases was removed from expenditure on other goods and services. That has eliminated about 13,300 jobs elsewhere in NSW. This is without including jobs lost because businesses also have faced massive increases in wholesale electricity prices, which has caused many to cease business in the state and others to cut back employment to offset the increased electricity costs. AEMO data shows business uses about 73% of total Australian electricity production, with 27% going to household use. Thus business uses almost three times as much electricity as do households. The excess cost to NSW households is now about $4Bn p.a. Another larger cost burden is falling directly on NSW businesses, which also destroys jobs. You appear to believe your job is Minister for energy bureaucracy and meetings, rather than the minister responsible for ensuring cheap, secure power is delivered to the people of NSW. 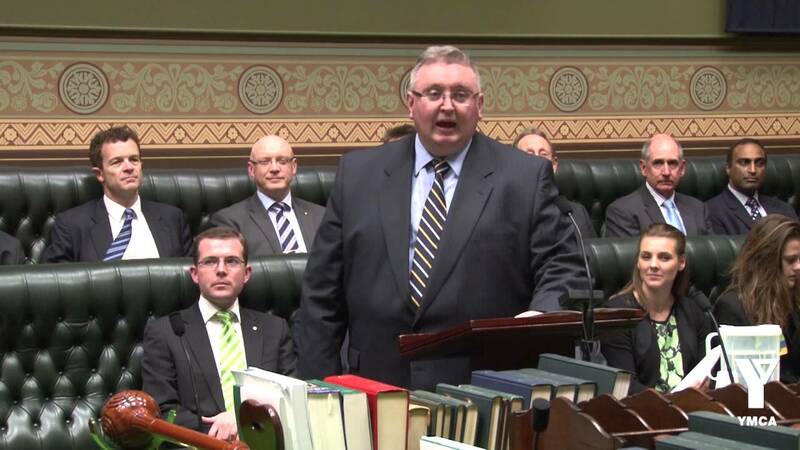 Minister, if you can’t do the job of restoring NSW electricity security and returning real electricity prices to those of a decade ago, step aside and tell the Premier to put someone in the role who will take personal responsibility and accountability for doing so and actually looking after the people of NSW instead of an ever-growing body of profiteers and bureaucrats for whom the people of NSW are being forced to pay. Dr Crawford’s letter is available here in PDF: Reply to Minister Harwin re NSW Electricity Delivery 20170811 – which is worth opening and digging in to, as it contains the risible response to letters sent by Dr Crawford to the NSW Premier from Don Harwin, NSW’s Minister for Cranking Up Power Prices & Wrecking NSW’s Grid, the letter that prompted the stinging riposte above. For the time being, NSW has a power pricing advantage over South Australia, where average retail power prices have reached $471.30 per MWh (47.13 cents per KWh) as against $391 per MWh (39 cents per KWh) – $80.30 per MWh (or 20%) less than SA. How long New South Wales maintains that margin depends upon Don Harwin’s appetite for destruction. Arguing on economic or scientific merit with brainwashed global warming acolytes is a fool’s errand. They are on a “holy” mission to save the world and they have been strengthened in their resolve recently by the additional challenge to prove Americans and they’re Trump-voting, Paris-shunning electorate wrong. Some won’t be deterred until the train crashes on the floor of the valley below. Others, who currently harbour just a modicum of caution will bale out just before the train goes over the edge when they are faced with the personal reality that their own economic and family assets are more prized than their religious fervour. The acolytes honestly believe there is no greater threat than global warming and therefore, no limit – economically or otherwise – to the measures needed to counteract it. The great High Priest Gore just recently elicited further commitments from his awestruck followers. If solar and wind electricity generation is not currently providing sufficient electricity for the masses, it’s not for the performance of those generators, it’s simply that there aren’t enough in use. Build more! Lots more if necessary. The political reality: The acolytes are in charge of both major Australian political parties at the state and federal level. There happens to be just a few more non-believers at the Liberal party with their collective hand resting without much commitment on the brake lever that is hindering the more rapid approach of the train to the cliff. After the next election, it appears that hand on the brake will be lifted. Full steam ahead! Australia to lead the world. Can anyone out there in lawyer-land advise whether there would be any constitutional impediment preventing a future “Government of National Salvation” to pass laws that could cause the persons in high office who are killing our country by enabling these insane renewable energy scams to be retrospectively prosecuted for their egregious failures? The objective would be to strip them of their personal assets by virtue of multi-million dollar fines. How about it you legal experts? I think your proposition is a valid cure for the havoc being wrought on the Australian public by the bunch of fools who are running the country now. It is far past the time when the old adage of who you vote for is what you get when there are only two parties of idiots to vote for. In the modern world these pompous fools who have no idea about running anything but want the big money and perks of political office should be held to account for any errors or stupid policies they enact on the public while in office with even jail terms and huge fines being imposed if a conviction of gross negligence can be proven in a court of law. The South Australian Government is a perfect example where all the labor members should face trial for what they have done and the other state governments might just see the error of their ways and what they plan to do to their states too. The new party election slogan might be “Only competent candidates need apply”. This could have been said about what’s happening in Ontario. The lack of competency, especially with the energy portfolio, is absolutely frightening. Unfortunately the last time this was successfully enacted was I think in France. It included the public beheading of everyone the proletariat considered guilty. It really shook up the rest of the world at the time. I don’t think the more recent German experience was so effective at draining the swamp.Not enough blood on the carpet. Just the first of the disasters that the Australian lawyer politician class will rain down on the Australian public in the future. People who are schooled in taking money from one person to give to another are now in control of some of the most complex engineering and life support systems developed by engineers and scientists. Australia is now being run by the inmates from a lunatic asylum, but sadly in reality inmates from a lunatic asylum would probably do a much better job. Dear E. J. Waffle – you have cut to the chase and have summed up precisely the true nature of Australia’s problem – our incompetent and gullible politcians who have no understanding of the technical world and who are naively allowing themselves to be taken for a ride by their bureaucratic “Yes Minister” self-serving public servant manipulators – who one suspects must all be paid-up members of the insane Green Party.